Like almost all of the subjects he has explored in his sublime, handcrafted works over six decades of filmmaking, Les Blank is a master of an art that one must go off the beaten path to find. Even while he has been honored with retrospectives at lofty locales like the Museum of Modern Art in New York, he still hawks his wares--DVDs, t-shirts, posters and pins--that he totes in a well-traveled suitcase. Burden of Dreams, which he made with longtime collaborator Maureen Gosling, is perhaps the greatest film about filmmaking--or even the creative process--ever made. And yet, it's more than that. It immerses us as much in the Peruvian Amazon and the culture of its native inhabitants as it does in the careening imagination of Les' longtime friend, Werner Herzog. And it seems clear that the film played a role in helping the indigenous people of that region gain legal rights to their land. A Poem Is a Naked Person is perhaps the greatest film about rock 'n' roll and American music that you will likely never see. This film about Leon Russell can only be viewed in a non-commercial screening in Blank's presence--the aftermath of a lawsuit between Russell and the producer. "He never did tell me why he didn't want it shown," says Blank. "I try not to mention the name of the film or the subject [in publicity] because he's sued me a couple of times to stop me." These two opuses merely hint at the vivid cultural universe explored in Blank's body of work. Other musicians profiled in his films include Lightnin' Hopkins, Dizzy Gillespie, Lydia Mendoza, Tommy Jarrell, Flaco Jimenez, Boozoo Chavis, Mance Lipscomb, Francisco Aquabella and Clifton Chenier. And then there are films about garlic, gap-toothed women, a cowboy artist and, of course, Werner Herzog Eats His Shoe. Legendary folklorist Alan Lomax, a friend and an influence of Blank's, called his short The Sun Gonna Shine "One of the three most important films on the South." Blank seems to have followed his own American muse and captured magic along the way (he was even a camera operator on Easy Rider). Blank is a soft-spoken, deferential, visionary wayfarer. Throughout his body of work is a consistent, gold-standard high-wire act; he is fully present with the subjects and yet completely out of the way in the final film. The result is a rare breed of intoxicatingly intimate anthropology that brightens not just a corner of the world rarely seen by outsiders, but in most cases a defining and largely underappreciated element of American culture. Blank is currently at work on two long-term labors of love, like all his films--one about the late, legendary British documentary filmmaker Ricky Leacock and the other about Alabama outsider artist Butch Anthony. 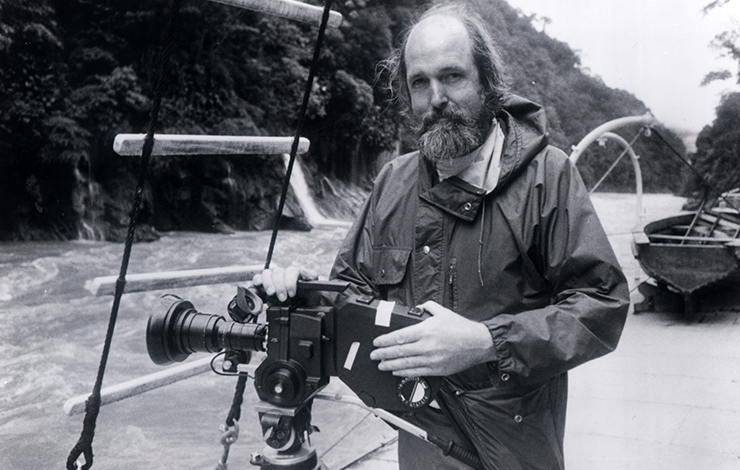 Blank once said of the people at the heart of his films, "I become them." Documentary recently spoke to the 2011 IDA Career Achievement Award honoree about that process, his career and whether or not Herzog really ate his shoe. Did you originally think you were going to work in narrative features? Les Blank: That was my plan from the very beginning. When I saw Ingmar Bergman's Seventh Seal, that sealed the deal. I decided then and there that I wanted to be around the making of films that had this impact, that were, spiritually and emotionally, deeply involving the very fiber of your being. Even if I couldn't make that film myself, I wanted to be in the presence of people who were making it, and help them with their vision. And where did the shift to documentary take place? While at USC, I took a course in documentary film and was very inspired by this whole medium. All I knew about documentary was what I had seen as a kid. They had short subjects and films called Bring 'Em Back Alive, where they would go into the jungle and catch these large pythons and things. This to me was thrilling, but I didn't think of being a filmmaker. It just seemed [like] too much magic, and I didn't know where to begin. There weren't film schools I knew of at the time, so it never was a consideration. But then an ethnographic filmmaker came through town and showed a film to our class about the people of the Kalahari Desert called The Hunters. The filmmaker, John Marshall, followed this group of men who were out hunting for their village, and if they failed to come back with an animal then everybody would starve to death. I thought, "To be able to make a film like this would be a great way to live one's life." When you started out, did you feel that doing the industrials or working on the military films was contrary to your politics? My main goal was just to learn filmmaking and eventually do something creative with filmmaking. So I learned the technique of shooting--and because the people I worked for were very cheap, I ended up doing all the work, like the sound recording, the camera work, writing the narration...Once I learned my craft, it was no longer very tolerable. In fact, I was about to lose my mind from the inanity of it all. And it starts coming out in some of the films I did, like Chicken Real, about the chicken industry. The films I like are bottomless; you can't really prove the exact depth of their feeling. 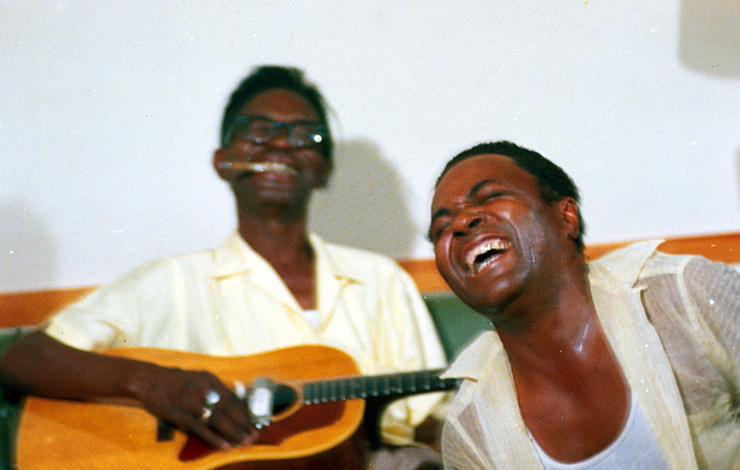 And there's vitality to the subject, like the Lightnin' Hopkins film. All I can do is grab at essences of what I think is there, but I never feel like I've gotten to the bottom of it. With The Blues According to Lightnin' Hopkins, the format was kind of organic-things flow out of something, there's really no reasonable arrangement of sequences and substance, it's just all merged from one to the next. It's more like music. It took a while to arrive at this style. But do you feel like in making that film, you discovered some of your own style, since that seems to be reflected in your other films as well? Yeah. I think having seen how this can work, I have used this approach in other films. Not always successfully, but it worked especially well with the Lightnin' film. So Werner did genuinely eat his shoe? He ate every piece of that shoe, except for the sole. He figured you eat chicken and you throw the bones away, so therefore he could throw the sole away. I took a piece just to see what it was all about, and I couldn't get it down. My vomit reflex kicked in. I asked him to come to my office the next day just to see if he was still alive and try to wrap up what it was all about, and that's how you got the speech. He was looking real ashen, but he was still standing and he talked about how the modern world needs new imagery, that stale images were going to cause us to die off like the dinosaurs. It was the experience of making Werner Herzog Eats His Shoe that gave me the courage to go with him down to Peru [to film Burden of Dreams]. I realized he had star quality, and that if I could get back alive and sane, I would have an interesting film, no matter what happened. But the trick was getting back alive...and sane. I was thinking of Americans whose body of work offers something comparable to what you've done, and Alan Lomax was the first person to come to mind. Do you feel like he or his work was a big influence? That's true. I greatly respect his work, but I felt he had kind of a narrow approach to making art, or to expressing the scene in the way I was doing. For instance, he told me that a good ethnographic cameraman would never use a zoom, never shoot short takes. They would get a wide-angle lens, put the camera on the tripod, turn it on the subject and step away. The scene should be interpreted by people who knew what they were doing. The subjective viewpoint of the cameraman would just muddy up the waters. I told him he was nuts. And we would argue over things like that. That's a crucial kind of debate you don't hear so much in documentary any more. Visual anthropology has died out a lot since then. Now, unfortunately, it seems like you're more likely to hear a debate over whether to use animation, rather than how to be accurately or ethically ethnographic. There's always seemed to be an American folklorist aspect to what you're doing. Is that conscious, or not so strategic? I tend to film things I find fascinating or interesting. I guess those are things that folklorists also look at. I really don't have guiding principles. I just drift to what I find interesting and also what I think audiences will like to see. I try to find a fresh way of looking at the world around me and making some sense of it--hopefully something positive, something lasting that the world would want to see 100 years from now. Taylor Segrest is writer and co-producer of Darwin (2011). He is currently at work on his next film, a narrative feature about the most tragically forgotten rebellion in American history. He is also a contributing editor for Documentary.